That’s a chart from the Pew Research Center for the People and the Press on the news stories Americans have been following the most closely so far this year. There’s been an awful lot of “real” news in the past few months — the Tucson shootings, the unrest in Egypt and Libya, the earthquake and tsunami in Japan — and, rightly, it has tended to soak up most of voters’ attention. 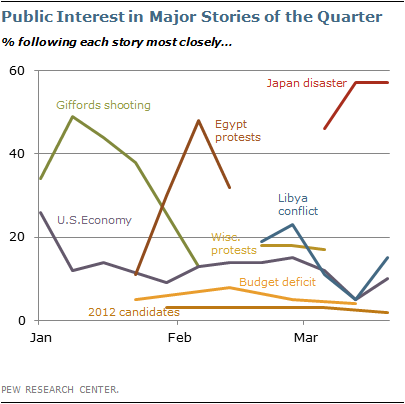 People are not focusing on stories related to domestic politics, like the debate over the deficit, or the 2012 elections. (The union protests in Wisconsin were a partial exception.) Even the economy has taken a back seat to some of these more dramatic stories. This is understandable behavior on the part of the public. From roughly late 2007, when the presidential campaign began to heat up, through last November’s midterms, we were in an “on” political cycle almost all of the time, with events like the Tea Party protests, the Democrats’ attempt to pass their health care bill and the special election in Massachusetts sustaining the momentum in periods that otherwise might have been slow. And though the battle for the 2012 Republican nomination has gotten off to an unusually slow start, people will start thinking more seriously about the race after Labor Day, from which point forward we’ll be in another “on” cycle until at least November 2012. These past few months, and the next few ahead, are a rare opportunity to take a breather, and most voters are taking one. Even the Tea Party is having trouble turning out its normally enthusiastic adherents. This may be salient because politicians have grown accustomed to operating in a high-stakes, high-intensity environment in which every move they make is scrutinized. But now, they find themselves operating in the doldrums, with little discernible momentum. But they might not realize this, because Washington is a political town 24 hours a day and 365 days a year, and the hamster wheel keeps turning even when the nation’s attention is focused somewhere else. When the public is less engaged with day-to-day politics, Washington acts as even more of an echo chamber, and politicians may conflate winning the support of elites with popular opinion. This is mostly a warning, I suppose, to Paul D. Ryan and the Republicans. His proposed budget for 2012 includes a number of politically risky changes, including to entitlement programs like Medicare and Medicaid. Mr. Ryan is probably not feeling that opposition in a visceral way yet — most voters don’t know who he is, let alone what his budget says. (Most voters don’t even know that Republicans control the House but not the Senate.) But the further Mr. Ryan and the Republicans take this proposal, the greater the risk of a backlash. In particular, most voters are not expecting a shutdown, so if one were to occur, the political winds could go from being nearly still to gale-force in a hurry. Mr. Ryan’s proposal covers fiscal year 2012 — not 2011 — so it has nothing to do with the shutdown in a statutory way. But voters could very easily conflate the two, particularly if his proposal is voted on in the House while a shutdown is under way. Does that mean Democrats ought to be drawing more attention to it? Perhaps, but getting the attention of a voter who is disengaged from politics is no easier than getting the attention of a teenager who is playing with an Xbox. Then again, a shutdown might be the equivalent of the only worthwhile solution: pulling the power cord.